Who is currently on tour with Celtic Woman? Where do I send fanmail for the girls? What about former members? How do I get Meet & Greet tickets? What should I wear to the concert? What about the Meet & Greet? Are cameras/photos allowed at the concert or the Meet & Greet? Do the girls lip sync? Who is the redhead on CW's logo? 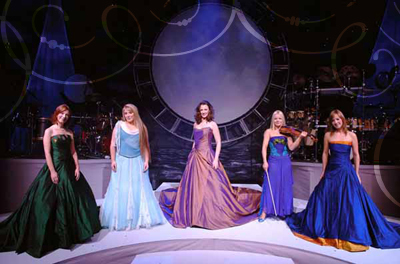 Who designs Celtic Woman's dresses? Why isn't O Holy Night on the A New Journey DVD? Is there an Isle of Hope CD or DVD? Q: Who is currently on tour with Celtic Woman? A: Fourteen women have been a part of the show over the years, the women currently on tour are Éabha, Mairead C, Susan, and Tara. Q: Where do I send fanmail for the girls? What about former members? Please note that while the girls are on tour their mail is held at the Dublin office and they won't get it until the end of the tour. For former members, be it a soloist, choir member, or instrumentalist, your best bet is to contact them through their official website or Facebook/Twitter as they probably won't get anything sent to the CW Dublin office. Q: How do I get Meet & Greet tickets? A: Meet & Greets (M&G) are a special arrangement between Celtic Woman and the local PBS and therefore tickets are only available through that PBS. Usually the M&G tickets and concert tickets are sold together during the PBS's pledge drive. There are only a limited number of M&G tickets available and they're sold on a first come first served basis. Q: What should I wear to the concert? What about the Meet & Greet? A: I've seen everything from suits to gowns to jeans at CW concerts. The best answer is to wear whatever you're comfortable in. Q: Are cameras/photos allowed at the concert or the Meet & Greet? A: No, most definitely not. An announcement is made before each show that says no photos or recordings are allowed during the show. To do so violates CW's copyright and woe betide anyone caught doing so. Photos will be allowed at Meet & Greets starting with the Spring 2011 tour. Q: Do the girls lip sync? A: The number of times we've heard this question (or accusation) is astounding. Mention it on the forum and you'll start a riot. No, the girls don't lip sync. No two performances are alike, the girls like to change things up a bit, and occasionally they do miss a note. Not to mention the numerous forum members who have sat up front and heard the girls' voices before they go through the sound system. Can't really fake that. Q: Who is the redhead on CW's logo? A: Short answer, she is a model. Long answer, she is supposed to represent the idealized Celtic woman. In reality, she's a French model and her red hair was added in with Photoshop. Celtic Woman's Irish label, Celtic Collections, had the photos of her from a previous photo shoot and she, in fact, appeared on a previous compilation for the company. Interestingly enough, the photo shoot was so long ago that no one even remembers her name. She is a complete mystery. Q: Who designs Celtic Woman's dresses? Q: Why isn't O Holy Night on the A New Journey DVD? A: When A New Journey was recorded in the summer of 2006 they also recorded O Holy Night from the Christmas album. The assumption has always been that because PBS was going to air the concert during their winter pledge drive they would use O Holy Night in their broadcasts. For whatever reason that didn't happen and to the best of our knowledge, it was never intended for the DVD. However, the video did eventually pop up on a German website in 2007 and it has since found its way to YouTube. Q: Is there an Isle of Hope CD or DVD? A: No. At one point the show was going to be filmed, but for various reasons the recording never took place and The Greatest Journey was released instead.